Faith: Year of projects and a 100th post giveaway! Well, there's no denying it now, we are very near the end of this Year of Projects. I discovered about it just a few weeks into beginning blogging, and boy am I glad I did! I am so pleased with what I have achieved during this year.....I know I wouldn't have without the YOP blog-a-long. I have finally finished my Colour Affection....YAY! I thoroughly enjoyed making this shawl, but the end was a little telling and I was becoming more and more worried about the dodgy edge! I'm pleased to say that the blocking has helped it a little, but it is still quite clear that its not quite right.....the tight increases and the twisted carrying of the yarn did it no favours.......my issue I expect, not the patterns, just too tight, giving it a different shape to other peoples......I have learnt a lesson though..... to check out others' modifications before ploughing in! To be honest, it is a tad shorter than I wanted it to be, but again, I think this is my tight knitting, not a poor pattern. My shawl and I have demanded a night out with my summer dress for a slap-up meal! 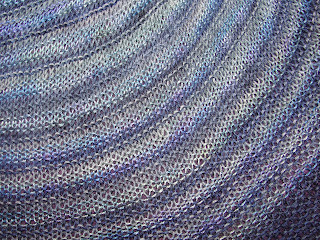 The yarns used for my CA shawl were all purchased from this years Wonderwool, the lightest colour is a lace weight yarn from 'The Old Piggery' which is a silk and Blue Faced Leicester mix in colourway Seascape. The other two yarns used were slightly heavier both Blue Faced Leicester/Nylon mix from Freyalyn's Hand-dyed Fibres in colourways Baranduin and Steelsheen. Up for grabs are a 50g skein of hand-dyed Merino wool also from The Old Piggery. A ball of DK weight Kingcole Riot and a copy of Knitting Brioche. Now for those who followed me as I did the Knit and Crochet Blogging week, I tried out a small amount of Brioche knitting and found it stretching for my basic knitting skills, but giving gorgeous results. This is an excellent book, with lots of techniques, photographs, diagrams and beautiful patterns. (In fact, I want to include some of these patterns in my next YOP list). There will be a couple of other things in the mix, most probably something to munch whilst you knit ;-) and maybe, if I get my act together something hand knitted to amuse you! My giveaway is by way of a huge thank you for all the lovely people who pop by and add an encouraging comment on my posts.......your words are precious and make my day! The rules are simple enough, just leave a comment on the bottom of this post, making sure to leave your blog link or email so I can get back in touch should you win! I will draw the winner and announce it on Saturday 30th June.....If you would like a second chance in the draw then feel free to blog about it and/or put a link on your sidebar (I gotta say, this always dumbfounds me a little, but just cut and paste the picture above if you like) please then pop back and let me know so I can enter your name again.......I'm quite blonde so spell it out! 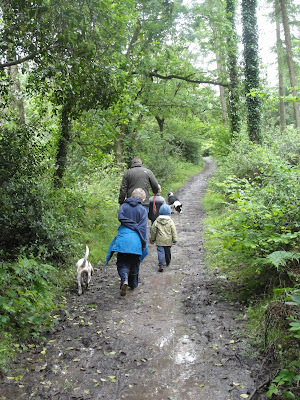 I will leave you now, with a quick pic of our weekend mud bath walk with kids and dogs in the woods yesterday. congrats on your lovely make and your 100th post! I would love to be entered into the giveaway - I do have a blog so you would be able to get in touch if Im lucky enough to win!! Thanks for the heads up on the cooking colour, I'm always looking for ways of improving my colours and that walk looks great, my little ones would enjoy that with muddy puddles no end ! What a lovely shawl. Your colour choices make it perfect for dressing up or dressing down. You definitely deserve a "slap-up meal". Congratulations on 100 posts! Lovely prize but you should leave my name out because I imagine the postage will be horrendous. I'm joining th year of projects this time round as it looks think it will be motivating. I really love your shawl and the colour is amazing. I love your shawl!! it definitely needs an outing and a slap up meal! And your shawl looks so pretty, and you know the crescent shape is good, it can help a shawl stay on your shoulders! Now m'dear, please don't worry about entering me in the giveaway as I already have a copy of the book. Here's to the next 100 posts! 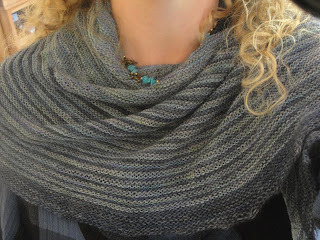 I love your Color Affection shawl - you definitely deserve the night out! Thanks for the generous giveaway. I would love to add the book and the yarny stuff to my collection :). Wow hon, 100 posts - that's a fabulous milestone! It's always a pleasure visiting your lovely blog and I can't wait to see what you get up to in the future. Here's to the next 100 posts!! I adore your shawl - it looks absolutely stunning. Clever girl aren't you. Ooh, lovely shawl Faith. I love the way it drapes so beautifully in the third pic...your definitely have to go out somewhere special to show it off! Congratulations on your 100th post!! I would love to be included in your lovely Giveaway and I'm just going to fly back to my place to add a link...be back shortly! Congratulations on your 100th post. I love reading your blog! congrats! 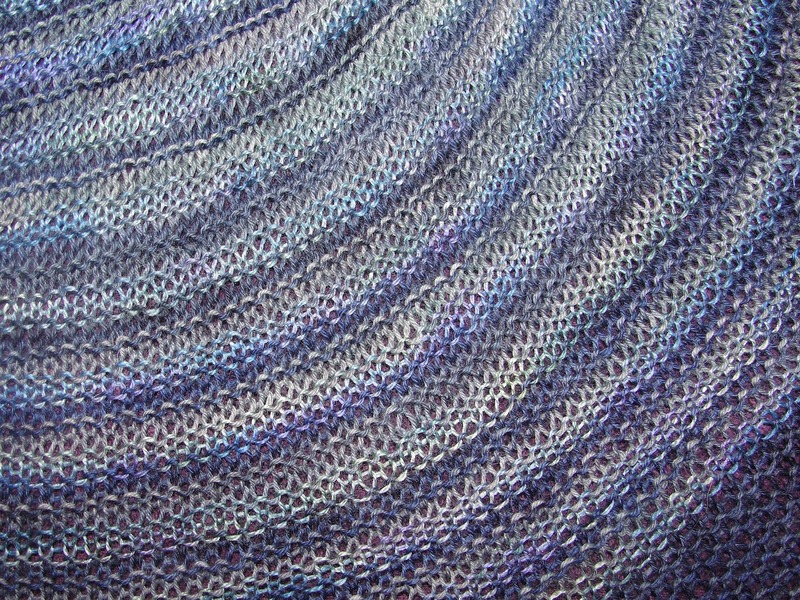 I also think the shawl is gorgeous. I've had several projects where I learned lots of things by completing them. I can't that yours isn't "right" it looks beautiful on. 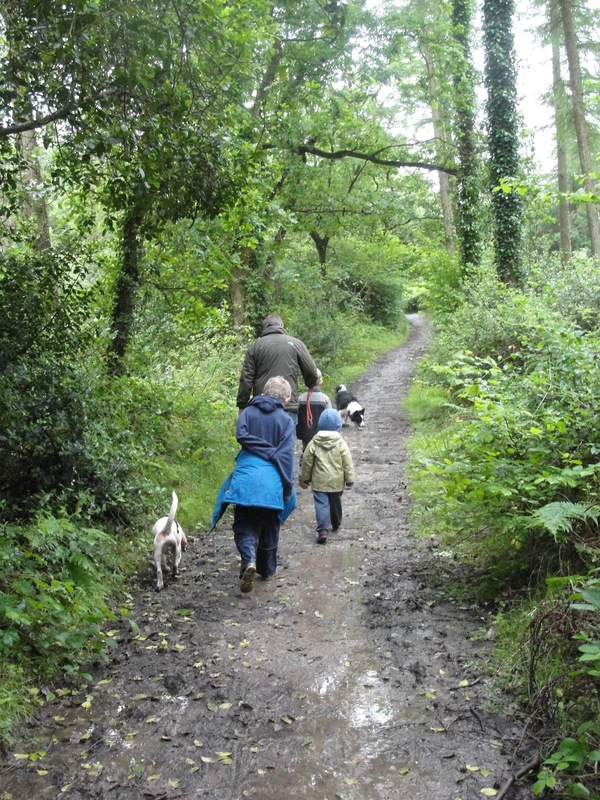 Enjoyed the walk about with the kids...more people should get out and about like you do. 100 posts....congrats thats cool. Count me in please and thanks. I think you shawl looks awesome, hope you had a lovely night out wearing it. Just added your link and photo and encouraged folks to hop over here to check out your give away. Count me in again, please and thanks! Congrats on your 100th post! I love your colour affection! I've definetly learnt to check out all the previous comments on Rav before I start a pattern after I had a similar problem with my Henslowe! What a great giveaway. I would love to be entered. All is brill- I love that shawl- gorgeous colours and I think it looks perfetct! 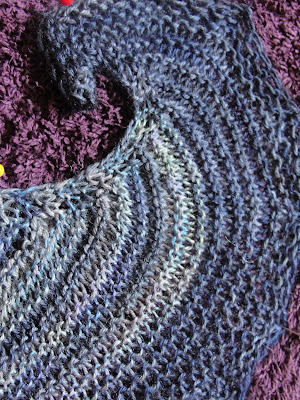 Look, don't enter me into the giveaway as I'm not a knitter yet (another to-do on my list!) and it would be wasted on me!!! Well done on 100 posts, too. I think the shawl looks great - we are always our own worst critics. I was particularly admiring the edge - so I'm not sure what you mean by dodgey. Truly it is a beautiful shawl. Congrats on your 100th post. I have so enjoyed getting to know you via your blog. P.S. I keep meaning to ask: how is your sister doing? I love the parting photo ... a walk in the woods is my absolutely favorite thing to do! Congrats on your 100th post. 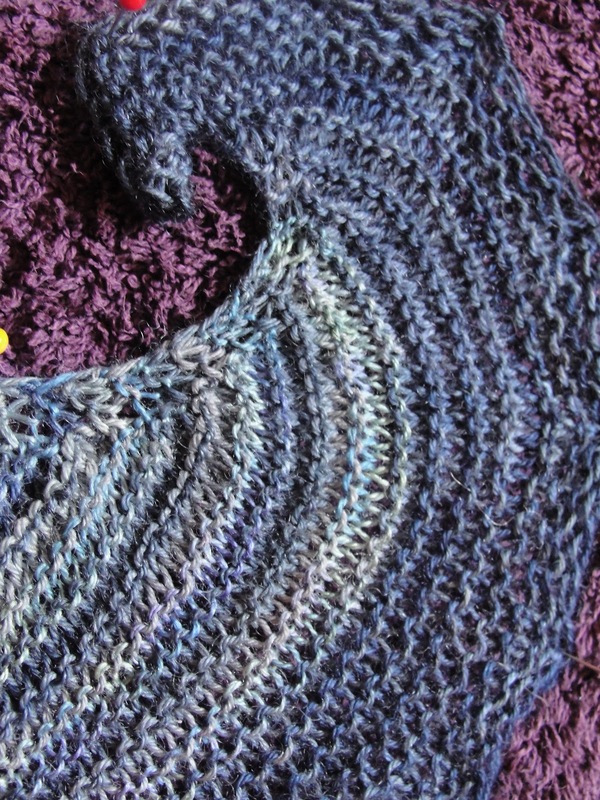 I spent a fair amount of time knitting the brioche stitch a few years back and loved it. isn't it fun to reach 100 posts?! I wish i would have been able to do a giveaway when i had mine. thanks for hosting one! i remember your brioche looking inspiring...perhaps i should add it to my YOP this year! Oooh, you have beaten me to a giveaway, I keep putting mine off and have now decided to wait until my birthday (I don't know why really). Your Color Affection is terrific and I love how you immediately put it to use! So sweet of you to have a giveaway :O). Don't know if I've said it before but awesome new header! I love the look. lovely giveaway faith - count me in! Your shawl is beautiful too....aren't we lucky to have found blogging?! Your shawl is GORGEOUS!!!! I think it drapes so beautifully and although I'm no expert, your knitting looks a far sight better than mine! LOL! Please enter me in the drawing but I am in the U.S. so if shipping is a concern just drop me out. I'm probably not of the caliber to do brioche anyway. I would love to know more about the YOP though. That sounds like a great way to motivate each other and get things done! Is it a blogging group? I'm terrible because I always think I have to have all my other work done around the house before I can "reward" myself with needlework but if that were the case I would never do any! LOL! I have never had my entire house all clean at the same time. I need a smaller house! You have the most beautiful places to walk and paths. Hope you are enjoying your summer. We could use some of your rain so please include that if I win! LOL! Oh, Faith. It turned out just perfect! Congratulations! Oh my heavens but that shawl is lovely! I will admit that I am not doing any more shawlettes as they are just too short for my liking, but yours looks nice and long to wrap up in. Congrats on your 100th postaversary! Finding your blog was a definite joy and all thanks to Year of Projects. :) Your give away is sweet and I would love to be counted in the running for it. Such a fun little package. Your shawl is beautiful! Thanks ever so much for the giveaway and congrats on your 100th postaversary. Congrats on 100 posts! That's so awesome! Pretty please pick me? It would make an awesome birthday gift. I really love your shawl and Congrats on your 100 posts! Thanks so much for the chance to win! I love how your shawl turned out! Congratulations on 100 posts, too! Congrats on your 100 posts. That's no small fete. I would love to be entered for your giveaway. Hello Faith, I love your shawl, so pretty and beautiful colours too. Please may I be added to the hat? Such beautiful pink colors, and an awesome book! Would love to add to my stash! Great giveaway, Faith! Thanks for hosting it!